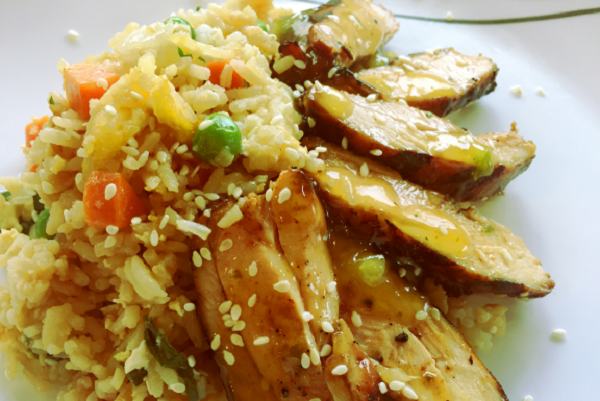 Sweet and tender Asian marinated chicken thighs grilled then served with fried rice and an orange honey sauce. 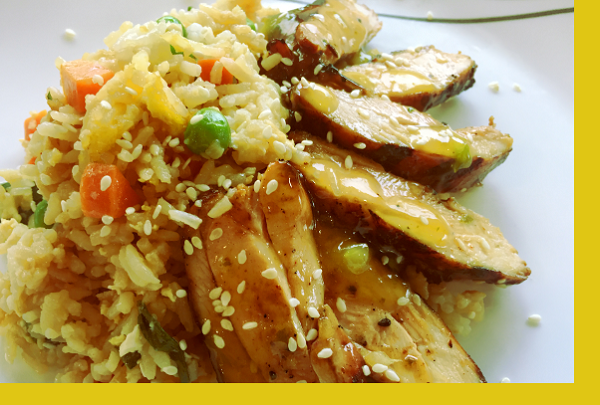 Quick, easy & flavorful for a fun weeknight dinner! Preheat Grill. Grill chicken for about 6 minutes per side or until cooked through. Beat egg(s) in a bowl. Heat 1 tablespoon (TBP) oil in a large saute pan over HIGH heat. Scramble eggs and remove. Add 1 more TBP of oil, vegetable packet and saute for 1 min. Add rice and saute 2-3 mins. Add soy sauce and heat 1 min. Mix in egg and remove. Reheat orange honey sauce. The fried rice was excellent. The real star was the orange honey sauce. I would love to see more of the sauce...maybe triple the quantity. This was my first time grilling chicken thighs and they were very good..but again, that sauce was over the top.